USD/JPY digested yesterday losses and surged 40-pips on Thursday's Asian session with 1.1217 high for today. Currently the pair is trading 112.10, hovering at 50-EMA at 112.05 preferring sideways trend and awaiting cautiously for further intake as U.S releases data on NY opening sessions. BOJ, as expected kept rates at current minus 0.1%, pushing back inflation target for sixth time and keeping policy steady with a bit hawkish stance contaminating USD/JPY spikes. Kuroda, BOJ Gov. will cross wires shortly with expectations that answers will be consistent with earlier statement but still, traders has to decipher words in case Kuroda got market off-guard. GBP/USD has traded 18-pips on Thursday with 1.3014 low. The pair was on selloff wave on Tuesday after receiving negative UK CPI, but still the pair is bullish as dips still fight 1.3000 level with a constant re-bounce and calling for further pressings if we still consider recent daily candles as a correction phase. The pair is still trading above 10-EMA (1.2990), currently 1.3034 intraday. Our preference: long positions above 1.1585 with targets at 1.1660 & 1.1685 in extension. Alternative scenario: below 1.1585 look for further downside with 1.1535 & 1.1495 as targets. Our preference: short positions below 1.3000 with targets at 1.2930 & 1.2900 in extension. Alternative scenario: above 1.3000 look for further upside with 1.3030 & 1.3055 as targets. Comment: as long as 1.3000 is resistance, look for choppy price action with a bearish bias. USD/JPY Intraday: key resistance at 112.10. EUR/USD extended the uptrend momentum supported by Draghi's Thursday hawkish QE comments. The pair rallied from 1.1479 low on Thursday and clocked 1.1682 high on Friday with extra +2-pips today, 1.1684 high. On the other hand, uncertainties still revolves around the greenback with absence of health care bill accelerating scandals about Russia meddling in Trump's election pushing U.S Index into 93.63 yearly low. Gold was on a superb performance on Friday set on +12.35 gain and 1255.85 high. Today the precious extended rallies but on a slower pace adding +3.75 and July new high record at 1258, currently trading 1256.55 intraday, above daily-EMA at 1243. Technically, H4 RSI stands at 79%, hourly RSI at 65%, and daily RSI at 61.4%. On the other hand, Fibo level 61.8% indicates $1261 price. Taking into consideration that gold is currently bullish, but in XAUUSD wants to press forward, expectations for some correction consolidation sessions where market balances itself. Add to that, U.S Index been on an aggressive selloff wave hitting yearly low today at 93.63 low with daily RSI at 25% which indicates for some upward corrections pressuring gold for some retreats. On ZigZag pattern, gold dropped from 1296 high to 1204 low, lower than last time gold rallies from 1214 low, so expectations that gold rallies are on the maturing phase. Comment: The market is bullish and could yet extend the drive, but be careful for resistance near 11735-50. A close over 11750 is needed to fuel another aggressive bull wave. Be on guard for near term corrective dips and shift to sideways-defensive congestion. A close under 115915* will inject selling pressures, but only a close under 11510* triggers a lasting short term top. Comment The market is short term bullish, but Monday's spike rally hit the expected 9049* resistance / bull objective. A close over 9049* is needed to continue bull trending to higher prices near the old downturn level around 9150+/-. Suspect setbacks from 9049* to retrace last week's range. A close under 89465* damages the bull advance, calling for a multi-week correction phase. GBP/USD failed to withhold yesterday's strong gains after clocking 1.3083 high, the pair was on a selloff wave landing on 1.3007 low and closing at 1.3024 with an inverted daily pin bar, still flirting with 10-EMA at 1.3000 level. Current daily RSI stands at 57% indicating bullish to neutral bias which gives enough space for the pair for pressing upwards in case UK GDP comes in favor of GBP/USD bullish trend. GBP/USD currently trading 1.3013 intraday with 16-pips price action. Crude Oil managed to gain +2.27 On Tuesday after clocking $48.65 high, however, oil failed to add any $-pip value today, after a minor dip at 48.15. Currently, oil is trading with low price action with 43-pip-value, but expectations of higher volatility as markets awaits U.S Inventories release today 2:30 PM GMT. Positive Fundamentals since Monday has been pushing oil and contributing to oil bullish forces. First reports of U.S crude stocks falling sharply last week by 10.2 million barrels in the week ending July 21 to 487 M while expectations were at 2.6 M. Add to that, The market has been buoyed by Saudi Arabia's announcement at a meeting of the Organization of the Petroleum Exporting Countries (OPEC) and non-OPEC producers on Monday that it would limit crude exports to 6.6 million barrels per day (bpd) in August, down nearly 1 million bpd from a year earlier. (Reuters). Today, U.S Feds will release FOMC statement and analysts are divided about tilts or stance. The main points to be discussed are potential rate hike by 2017 and current balance sheet tapering. Market will be volatile, there is no doubt about that, along with it, gold will be on ups and downs. Traders can benefit if they managed to decipher a hawkish or dovish, but analysts could see the statement in their own perspective in case of vague or hidden as devils lies in details and Yellen has been noticed recently by not giving confirmed hints to build on. Preferable, to wait for a 100% confirmation with following three difference scenarios for gold to take next step for shortening or longing. Currently gold is traing 1246 and has not overpassed 1247.50 or dropped below 1244.50, indications that market is poised for FOMC so long waited this afternoon at 6:00 PM GMT. Today, the U.S Federal Reserve will announce the rates with high expectations for a no change and will maintain at current 1.25%. Along with it, FOMC economic projections, a statement, and finally a press conference which will create chaos in the market depending on the content of the answers. In case Yellen has the intention and was serious by gearing up the market, then expect intended hints because Yellen usually delivers vague speeches, leaving market confused. FOMC will focus on two elements, December odds rates and more importantly, current QE program and the edition that will undergo. Enough said, market already knows the above and there is no doubt about it. The real question will be, is end of 2017's rates December is still on the table? In case yes, what are the odds for that (currently below 50%). Any hints that rates odds has increased, and the Feds are serious expressing concerns that inflation has increased by 0.3% since last recorded 0.1%, and its meeting their projections, and its being intolerant, this to be taken hawkish and will boost the buck. On the other hand, a dovish scenario will be that inflation is still below 2%, and any rate decision will be subject to further coming data. Second, Now this part has been covered, we come to the balance sheet that Yellen promised in last FOMC meeting relatively soon. Market is expecting date and numbers, any failure to deliver on this part, the DXY will take a dip. In case an announcement came out that starting by October and December trimming the balance sheet by $10 billion a month for the first three months, $20 billion per month for the next three, and on and on until it hits a pace of $50 billion per month. This will create a high demand of the U.S Dollar and Index will peek (Hawkish Scenario). In case dates were set without numbers given, this will be left for the market and how they feel about it as its considered neutral. Just a reminder that during last Jackson hole meeting, Yellen has announced that the QE ( Quantitative Easing Program or Bond Purchasing ) has been introduced after 2008's crisis and has kept global monetary policy system safe and its still exist for a reason. One can only wonder how far will Yellen go giving up such a measure especially that Trump is in the oval office. Finally, recent FOMC members who crossed wires during Sep has expressed a hawkish tone towards rates especially on Dec, we will see how far their statement is serious tonight. On the other hand, it is highly expected that Yellen will end its term as head of U.S Federal reserve during 2018 and be replaced by Cohn, Trump's favorite as they both prefer low rates.Trump has already expressed that previously and hinted for Yellen his desire for low U.S dollar which has kept the greenback from seeing the light, if not intentionally, then by his demand for building the wall, elevating the sharp war tone on NK, delay on tax plan, health care bill, last but not least, his twitters, always tackling the Dollar, and so on. There is a scenario that Yellen, and out of her concern for U.S monetary policy could take market off guard by a rate increase, if not today, maybe during December even if expectations hints for a no. In case of that, market will be caught off guard and U.S Index will be rallying with fire and fury just like BOC did last meeting where they hiked. After expressing the above fundamentals, here is technical overview for CFD's including currencies, commodities, and indices to have an idea where and will market will head. After a hawkish FOMC sentiment, gold was on a selloff mode extended from Wednesday 1316 high, ended on Thursday with 1288.20 low. Today, the precious metal made some upward correction retracement clocking 1298.75 high and currently showing some stamina hanging above 1295 support area as the tension renews after NK threatens by an H bomb in the Pacific. Technically, closing below 20-EMA and 50-EMA level indicates a 100% downtrend with expectations to test 1285 level, in case XAUUSD closed below that level, then the second destination will be the 70's area. On the other hand, daily RSI is below 50 level, at 44 which is another proof that till further notice, bearish trend overwhelms. On the other hand, the U.S Dollar today is showing weakness and the boost by FOMC seems to be short as the DXY plunged to 91.56 low, and has been bearish for the second day with daily RSI still below 50 at 43. Right now, gold is trading 1296, and has sustained this price strongly, rejecting 1295 area as political tension is renewed, and four hours candles closed above 1296 which indicated that gold could retest 1300-4 area, but market still awaits for NY sessions to open and see how market reacts technically and fundamentally are on opposite terms. Closing on daily and H4 time frame will giver a better outlook how gold will perform next week. There is a scenario that taking into consideration that today is Friday and usually NK puts words into action on weekend, such scenario could keep gold levels poised till Monday. Our preference: short positions below 1.1960 with targets at 1.1890 & 1.1860 in extension. Our preference: long positions above 1.3490 with targets at 1.3590 & 1.3620 in extension. Alternative scenario: below 1.3490 look for further downside with 1.3450 & 1.3405 as targets. Our preference: long positions above 111.95 with targets at 112.60 & 113.00 in extension. AUD/USD Intraday: bullish bias above 0.7935. Our preference: long positions above 0.7935 with targets at 0.7985 & 0.8005 in extension. Our preference: short positions below 1298.00 with targets at 1288.00 & 1277.00 in extension. Crude Oil‏ (WTI)‏ (X7) Intraday: bullish bias above 50.30. Our preference: long positions above 50.30 with targets at 50.75 & 50.90 in extension. Our preference: long positions above 1.1755 with targets at 1.1810 & 1.1835 in extension. Alternative scenario: below 1.1755 look for further downside with 1.1720 & 1.1690 as targets. Overall, the trend is down and today's upward rebounds are part of correction retracement for more downward action. A close over 1.1930 is needed to rekindle the bull trend. Our preference: short positions below 1.3430 with targets at 1.3370 & 1.3340 in extension. Alternative scenario: above 1.3430 look for further upside with 1.3460 & 1.3500 as targets. General long term outlook: The market remains in a corrective setback against the prevailing bull trend, hinting for possible topping action. A close under 1.3351* opens up potential to 1.3200*. Stay prepared for defensive trading pressures, but stabilizing off 1.3351* could swing trade back to recovery action A surge back over Friday's 1.3600 high or close over 1.3542* rekindles bull forces and should spark rallies back to the last high. Look out for Carney Speech today at 2:00 PM GMT. A hawkish stance will boost GBP/USD, and a dovish statement could turn GBP/USD trend bearish for next trading days. Focus if there are any tips regarding coming interest rates by BOE. Our preference: short positions below 112.75 with targets at 112.40 & 112.20 in extension. Alternative scenario: above 112.75 look for further upside with 113.00 & 113.25 as targets. Comment: the upward potential is likely to be limited by the resistance at 112.75. Overall, the trend is bullish, and today's dips would be part of downward retreacements, preparing for a larget bull wave attack. Closing below 111.20-30 signals for a downtrend. AUD/USD Intraday: bullish bias above 0.7830. 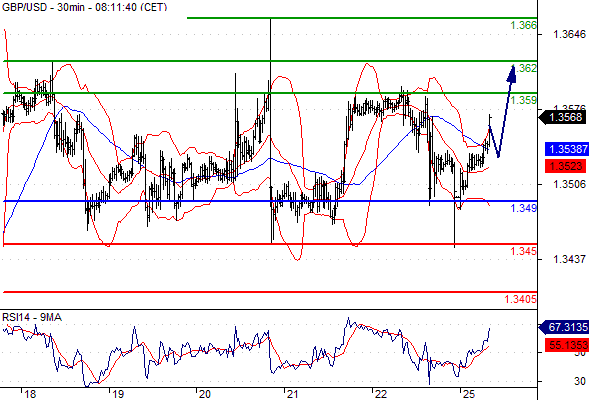 Our preference: long positions above 0.7830 with targets at 0.7860 & 0.7880 in extension. Alternative scenario: below 0.7830 look for further downside with 0.7805 & 0.7780 as targets. Comment: a support base at 0.7830 has formed and has allowed for a temporary stabilisation. Comment: Overall, the general trend is still down. Today's and Monday's upward retrwcement are part of a correction, preparing for deeper dips. A close over 0.7908 is needed for reversing trend and become bullish. Our preference: long positions above 1282.00 with targets at 1289.00 & 1295.00 in extension. Alternative scenario: below 1282.00 look for further downside with 1276.00 & 1271.00 as targets. Comment: The market is bearish, but against the 1282.50- target. The market posture remains negative and close under 128450-1280 implies declines to 1270-1267. Yesterday's rebound from under 1282.50 should put us on guard for stalled declines and minor turn that could trigger a rebound into 2-3 flagging congestion days near 1300. A close over 1301.10* is friendly. 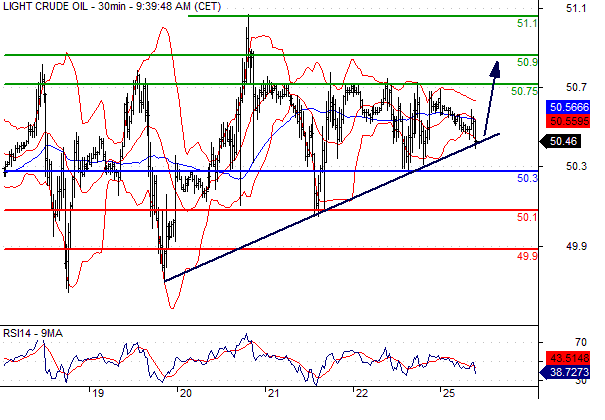 Crude Oil‏ (WTI)‏ (X7) Intraday: break of a ST rising trendline support. Our preference: short positions below 51.85 with targets at 51.20 & 50.75 in extension. Alternative scenario: above 51.85 look for further upside with 52.25 & 52.85 as targets. Comment: The market is bullish, powering a breakout run up from congestion. The market alignment holds potential for additional rallies to 52.60+/-. Any corrective congestion contained to the upper edges of Monday's run will remain aligned for rallies. Only a close under 50.76* signals a topping turnover. GBP/USD rallied on Monday's Asian clocking 1.3398 high, testing 10-EMA 1.3400 successfully, and retreated to 1.3331 low, still testing 20-EMA area since Thursday, but has closed below it, which keep the daily trend bullish. Fundamentally, PM May promised on Saturday to deliver the best deal for Brexit and offered her apologies for putting the Conservatives under pressure after the snap election that ended in less control for UK Parliament and within her party, My is under pressure as calls for resignation has been requested which explain the why the Pound in under selloff wave today ahead of UK Manufacturing PMI. Comment The market remains in a corrective setback against the prevailing bull trend, hinting for possible topping action. A close under 1.3371* opens up potential to 1.3225*. Stay prepared for defensive trading pressures, but stabilizing off 13381* could swing trade back to recovery action. A close over 1.3532* rekindles bull forces and should spark rallies back to the last high. Our preference: short positions below 1.1740 with targets at 1.1680 & 1.1645 in extension. Alternative scenario: above 1.1740 look for further upside with 1.1770 & 1.1800 as targets. Our preference: short positions below 1.3315 with targets at 1.3205 & 1.3165 in extension. Alternative scenario: above 1.3315 look for further upside with 1.3355 & 1.3400 as targets. Our preference: long positions above 112.75 with targets at 113.25 & 113.50 in extension. Alternative scenario: below 112.75 look for further downside with 112.50 & 112.20 as targets. 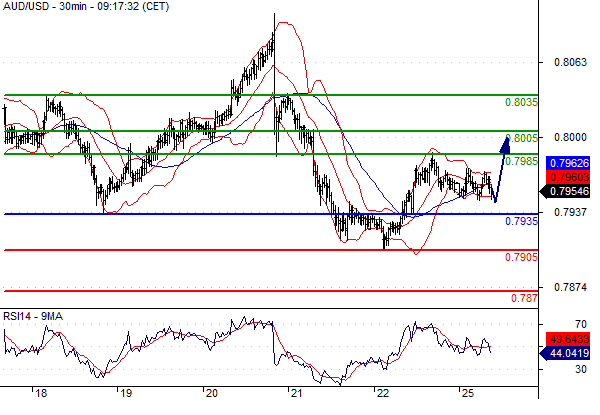 Our preference: short positions below 0.7850 with targets at 0.7790 & 0.7765 in extension. Alternative scenario: above 0.7850 look for further upside with 0.7875 & 0.7900 as targets. Our preference: short positions below 1277.00 with targets at 1267.00 & 1262.00 in extension. Alternative scenario: above 1277.00 look for further upside with 1281.00 & 1286.50 as targets. Crude Oil‏ (WTI)‏ (X7) Intraday: under pressure. Our preference: short positions below 50.95 with targets at 50.05 & 49.75 in extension. Alternative scenario: above 50.95 look for further upside with 51.30 & 51.75 as targets. Our preference: long positions above 1.1735 with targets at 1.1780 & 1.1800 in extension. Alternative scenario: below 1.1735 look for further downside with 1.1715 & 1.1695 as targets. Our preference: short positions below 1.3290 with targets at 1.3230 & 1.3205 in extension. Alternative scenario: above 1.3290 look for further upside with 1.3355 & 1.3400 as targets. Comment: the upward potential is likely to be limited by the resistance at 1.3290. Our preference: short positions below 112.95 with targets at 112.30 & 112.05 in extension. Alternative scenario: above 112.95 look for further upside with 113.20 & 113.50 as targets. Our preference: long positions above 0.7825 with targets at 0.7875 & 0.7890 in extension. Alternative scenario: below 0.7825 look for further downside with 0.7800 & 0.7785 as targets. Crude Oil‏ (WTI)‏ (X7) Intraday: capped by a negative trend line. Our preference: short positions below 50.75 with targets at 49.75 & 49.25 in extension. Alternative scenario: above 50.75 look for further upside with 51.30 & 51.75 as targets. 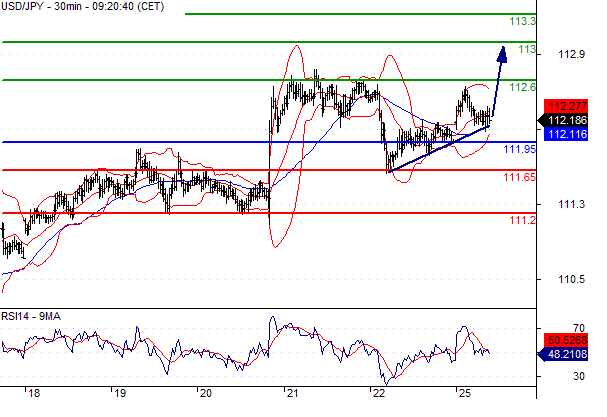 Gold spot Intraday: bullish bias above 1272.00. Our preference: long positions above 1272.00 with targets at 1281.00 & 1286.50 in extension. Alternative scenario: below 1272.00 look for further downside with 1268.00 & 1262.00 as targets. Our preference: long positions above 1.1745 with targets at 1.1800 & 1.1825 in extension. Alternative scenario: below 1.1745 look for further downside with 1.1725 & 1.1695 as targets. Our preference: short positions below 1.3250 with targets at 1.3165 & 1.3115 in extension. Alternative scenario: above 1.3250 look for further upside with 1.3290 & 1.3330 as targets. Our preference: short positions below 0.7855 with targets at 0.7815 & 0.7800 in extension. Alternative scenario: above 0.7855 look for further upside with 0.7870 & 0.7890 as targets. Crude Oil‏ (WTI)‏ (X7) Intraday: key resistance at 50.45. Our preference: short positions below 50.45 with targets at 49.75 & 49.25 in extension. Alternative scenario: above 50.45 look for further upside with 50.75 & 51.00 as targets. 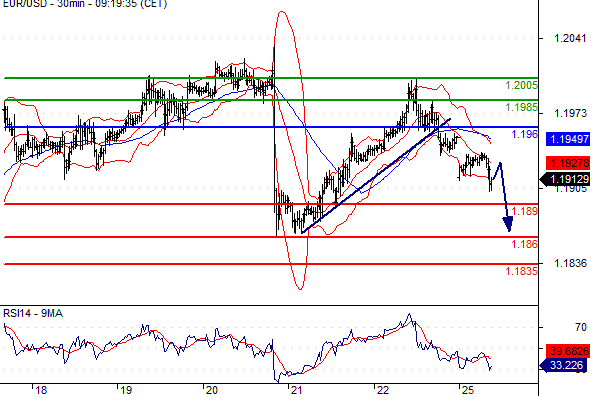 Gold spot Intraday: rebound expected. Our preference: long positions above 1270.50 with targets at 1278.50 & 1282.50 in extension. Alternative scenario: below 1270.50 look for further downside with 1268.00 & 1265.00 as targets. GBP/USD extends the recovery for the third consecutive session rallying from 1.3027 low on Friday, clocking 1.3198 high today after receiving a positive push by Manufacturing Production at 0.4% while expectations placed at 0.2%. On the other hand, the U.S Dollar continues to show weakness since Friday, dipping to to 93.21 low today, giving the Pound a wilder tone. Comment The market is short term bearish and a close under 1.3130 warns for pressing selloffs to 12986. Monday's rebound may carry over into today, but any corrections contained within last Thursday's range for 1-2 days should bear flag and keep the bear trend forces intact. A close over 1.3290* is needed for a short term bottoming turnaround. Our preference: long positions above 1.1785 with targets at 1.1860 & 1.1890 in extension. Alternative scenario: below 1.1785 look for further downside with 1.1760 & 1.1735 as targets. Our preference: long positions above 1.3175 with targets at 1.3225 & 1.3260 in extension. Alternative scenario: below 1.3175 look for further downside with 1.3130 & 1.3100 as targets. Our preference: long positions above 112.20 with targets at 112.55 & 112.80 in extension. Alternative scenario: below 112.20 look for further downside with 111.95 & 111.65 as targets. AUD/USD Intraday: bullish bias above 0.7770. Our preference: long positions above 0.7770 with targets at 0.7800 & 0.7820 in extension. Alternative scenario: below 0.7770 look for further downside with 0.7745 & 0.7730 as targets. Comment: a support base at 0.7770 has formed and has allowed for a temporary stabilisation. Crude Oil‏ (WTI)‏ (X7) Intraday: bullish bias above 50.70. Our preference: long positions above 50.70 with targets at 51.20 & 51.50 in extension. Alternative scenario: below 50.70 look for further downside with 50.45 & 50.00 as targets. Comment: the RSI lacks downward momentum. The prices remain bullish above the horizontal support at 50.70, and are likely to challenge the resistance at 51.20, representing Oct 5 top. Gold spot Intraday: bullish bias above 1285.00. Our preference: long positions above 1285.00 with targets at 1294.00 & 1297.00 in extension. Alternative scenario: below 1285.00 look for further downside with 1281.00 & 1279.00 as targets. Gold has surged $34 since Friday, and clocked 1294.30 high yesterday, giving positive signs of trend reversal and turning bullish in case the precious metal managed to close above 1295 in the coming days. On the other hand, renewed tension between USA and NK is attracting safe haven buyers pushing gold higher. Add to that, the DXY continues to show weakness with 92.87 low today giving XAUUSD more chance to seek higher price. Technically, on daily chart, gold has closed above 10-EMA for the third consecutive session and we can notice that daily 5-EMA crossing below with 10-EMA. On H4 time frame, gold rallied from 1260 and closed first 1278, then closed 1288, finally yesterday, gold closed above 1292. This is an additional early sign giving that H4 closing time is going on a higher H4 levels. Today, as FOMC statement will be released, we will see how gold behaves and closes on daily and four hours time frame. In case gold tested 1280+ support and managed reject these prices, then market should expect further rallies extended above at 1295 and 1300+. In case gold showed deeper retracement and closed below 1278, it is an indication that the precious metal has entered the old range between 1200 and 1296 and recent rallies were a correction phase preparing for depper dips aimed at 1260+/-. Comment: The market is showing a correction, trying to retrace for a test of key 1295.20* resistance and challenge for a bottoming turn. Trade may again try to foster rallies, but trade capped by 1295.20* will retain bear forces, likely easing for defensive congestion along 1282.00. A close under 1277.70* alerts for secondary selloffs against Friday's spike. Our preference: long positions above 1.3210 with targets at 1.3290 & 1.3320 in extension. Alternative scenario: below 1.3210 look for further downside with 1.3175 & 1.3130 as targets. Our preference: short positions below 112.60 with targets at 112.10 & 111.95 in extension. Alternative scenario: above 112.60 look for further upside with 112.80 & 113.05 as targets. Our preference: long positions above 1.1830 with targets at 1.1890 & 1.1925 in extension. Alternative scenario: below 1.1830 look for further downside with 1.1795 & 1.1760 as targets. Our preference: long positions above 0.7790 with targets at 0.7840 & 0.7860 in extension. Alternative scenario: below 0.7790 look for further downside with 0.7770 & 0.7745 as targets. Crude Oil‏ (WTI)‏ (X7) Intraday: the bias remains bullish. Our preference: long positions above 50.82 with targets at 51.40 & 51.75 in extension. Alternative scenario: below 50.82 look for further downside with 50.45 & 50.05 as targets. Our preference: long positions above 1290.00 with targets at 1301.00 & 1306.00 in extension. Alternative scenario: below 1290.00 look for further downside with 1284.00 & 1281.00 as targets. Our preference: long positions above 1.3220 with targets at 1.3290 & 1.3345 in extension. Alternative scenario: below 1.3220 look for further downside with 1.3175 & 1.3125 as targets. Our preference: short positions below 112.45 with targets at 111.95 & 111.80 in extension. Alternative scenario: above 112.45 look for further upside with 112.60 & 112.80 as targets. Our preference: short positions below 1.1855 with targets at 1.1820 & 1.1795 in extension. Alternative scenario: above 1.1855 look for further upside with 1.1880 & 1.1900 as targets. Our preference: long positions above 0.7805 with targets at 0.7855 & 0.7875 in extension. Alternative scenario: below 0.7805 look for further downside with 0.7785 & 0.7770 as targets. Crude Oil (WTI) (X7) Intraday: rebound expected. Our preference: long positions above 50.25 with targets at 51.10 & 51.40 in extension. Alternative scenario: below 50.25 look for further downside with 49.75 & 49.20 as targets. Comment: the RSI advocates for further advance. A strong support base around 50.25 (the previous swing low) has formed,and should limit any downward attempts. Our preference: long positions above 1289.50 with targets at 1301.00 & 1306.00 in extension. Alternative scenario: below 1289.50 look for further downside with 1284.00 & 1281.00 as targets. Our preference: short positions below 1.1825 with targets at 1.1775 & 1.1760 in extension. Alternative scenario: above 1.1825 look for further upside with 1.1850 & 1.1875 as targets. USD/JPY Intraday: intraday support around 111.65. Our preference: long positions above 111.65 with targets at 112.05 & 112.25 in extension. Alternative scenario: below 111.65 look for further downside with 111.40 & 111.20 as targets. Our preference: long positions above 1.3260 with targets at 1.3325 & 1.3350 in extension. Alternative scenario: below 1.3260 look for further downside with 1.3230 & 1.3180 as targets. Our preference: long positions above 0.7850 with targets at 0.7900 & 0.7920 in extension. Alternative scenario: below 0.7850 look for further downside with 0.7825 & 0.7805 as targets. Crude Oil‏ (WTI)‏ (X7) Intraday: further advance. Our preference: long positions above 51.35 with targets at 52.40 & 52.85 in extension. Alternative scenario: below 51.35 look for further downside with 50.95 & 50.55 as targets. Our preference: long positions above 1295.00 with targets at 1310.00 & 1315.00 in extension. Alternative scenario: below 1295.00 look for further downside with 1290.00 & 1284.00 as targets. GBP/USD peeked yesterday to 1.3311 but failed to guard 1.3300 level and dipped to 1.2325 low and closed above 10-EMA at 1.2350 reviving the daily trend to turn bullish, depending on how the pair closes on daily time frame. Today, the cable is trading flat with 38-pips price action after clocking 1.3268 high, ahead of UK CPI inflation report, followed by BOE's Gov. Carney with expectation for a tone to set the Pound in a certain direction depending on the data outcome. Expectations are placed at 3.00% compared to 2.9% on previous sessions. In case CPI managed to score a 3% and above, the pair will set a new course with a bull destination as the data could motivate Carney for a hawkish tone. Comment: Overall the market is short term bearish with near term rebounds capped trying to push beyond 1.3285 resistance. A close over 1.3285* or pop over 1.3333-50 signals short term bottoming upturn and could launch a climb to the 1.3410+ area. The roll off from 1.3285 hints for bear forces to pressure selloff back with last Thursday's range. A close under 1.3200 alerts for secondary selloff. Our preference: short positions below 1.3290 with targets at 1.3220 & 1.3180 in extension. Alternative scenario: above 1.3290 look for further upside with 1.3325 & 1.3350 as targets. Comment: as long as the resistance at 1.3290 is not surpassed, the risk of the break below 1.3220 remains high. Our preference: long positions above 111.85 with targets at 112.30 & 112.55 in extension. Alternative scenario: below 111.85 look for further downside with 111.65 & 111.40 as targets. Our preference: short positions below 1.1800 with targets at 1.1740 & 1.1715 in extension. Alternative scenario: above 1.1800 look for further upside with 1.1815 & 1.1835 as targets. Our preference: short positions below 0.7875 with targets at 0.7825 & 0.7805 in extension. Alternative scenario: above 0.7875 look for further upside with 0.7900 & 0.7925 as targets. Comment: as long as 0.7875 is resistance, look for choppy price action with a bearish bias. Our preference: long positions above 51.50 with targets at 52.40 & 52.85 in extension. Alternative scenario: below 51.50 look for further downside with 50.95 & 50.55 as targets. Our preference: short positions below 1296.00 with targets at 1284.00 & 1282.00 in extension. Alternative scenario: above 1296.00 look for further upside with 1300.00 & 1306.00 as targets. EUR/USD prolonged the selloff sessions this week and yesterday, the pair dipped to 1.1736 low after clocking 1.1800 high, still testing daily 10-EMA zone with 5-EMA dropping below, indicating for additional bear forces to take control these coming days after making a correction last week. Today, EUR/USD the pair traded 22-pips price action and managed to record 1.1754 high then retreated 1.1758 low, currently trading 1.1764 intraday. Today, all eyes are focused on Draghi due to deliver a speech shortly afterwards without any clues how the ECB Gov. will set the tone. Any hints about QE winding or setting a date for shrinking the EU bond purchasing budget should set the EUR bulls in action. General Technical Overview: Overall the market is bearish and a close under 1.1741* suggests a selloff under last swing low. The larger formation cautions declines to 1.1600. Any near term rallies will likely be capped under 1.1840 - 1.1860 and likely stick to sideways congestion. A close over 1.1900* is needed to start a reversing turn back to higher levels. Our preference: short positions below 1.3200 with targets at 1.3120 & 1.3090 in extension. Alternative scenario: above 1.3200 look for further upside with 1.3235 & 1.3265 as targets. Our preference: long positions above 112.25 with targets at 112.80 & 112.95 in extension. Alternative scenario: below 112.25 look for further downside with 112.00 & 111.65 as targets. EUR/USD Intraday: key resistance at 1.1780. Our preference: short positions below 1.1780 with targets at 1.1715 & 1.1690 in extension. Alternative scenario: above 1.1780 look for further upside with 1.1815 & 1.1850 as targets. Our preference: short positions below 0.7860 with targets at 0.7815 & 0.7800 in extension. Alternative scenario: above 0.7860 look for further upside with 0.7875 & 0.7895 as targets. Our preference: short positions below 1284.00 with targets at 1275.00 & 1272.00 in extension. Alternative scenario: above 1284.00 look for further upside with 1289.00 & 1293.00 as targets. Comment: the break below the support at 1284.00 triggered a downward acceleration to 1272.00. Crude Oil‏ (WTI)‏ (X7) Intraday: further upside. Our preference: long positions above 51.65 with targets at 52.40 & 52.65 in extension. Alternative scenario: below 51.65 look for further downside with 51.45 & 51.20 as targets. Our preference: short positions below 1.3200 with targets at 1.3120 & 1.3070 in extension. Alternative scenario: above 1.3200 look for further upside with 1.3225 & 1.3260 as targets. Our preference: short positions below 113.15 with targets at 112.45 & 112.10 in extension. Alternative scenario: above 113.15 look for further upside with 113.45 & 113.75 as targets. Our preference: long positions above 1.1775 with targets at 1.1835 & 1.1860 in extension. Alternative scenario: below 1.1775 look for further downside with 1.1755 & 1.1735 as targets. Our preference: long positions above 0.7830 with targets at 0.7875 & 0.7895 in extension. Alternative scenario: below 0.7830 look for further downside with 0.7815 & 0.7800 as targets. Crude Oil‏ (WTI)‏ (X7) Intraday: the downside prevails. Our preference: short positions below 51.70 with targets at 50.95 & 50.55 in extension. Alternative scenario: above 51.70 look for further upside with 52.05 & 52.35 as targets. Our preference: long positions above 1276.50 with targets at 1289.00 & 1293.00 in extension. Alternative scenario: below 1276.50 look for further downside with 1273.00 & 1270.00 as targets. Last edited by FxGrow10; 19-10-2017 at 11:03. Gold rallied to 1306.10 high on Monday but failed to press forward and started deep retracements as price correction and ended today with at 1276.70 low, currently XAUUSD is trading 1286 after clocking 1288 high. On technical level, since gold closed above 1296, the trend shifted up and the failure to close below 1280 (Daily) kept the bull forces in action. At the moment we are standing two scenarios that awaits gold. First scenario is that gold will extend price correction towards 1290+ levels and could end the rally at 1295 forming head and shoulders pattern, then the daily candle will turn bearish and market should prepare for deeper retracement exceeding today's low aimed at 1258+ zone. The second scenario is that gold will reach the 1290+ area and closes above 1296 which set the precious metal on the track to 1305+ area washing the head and shoulders pattern. In case gold managed to close above 1305-08, then market should expect a search for higher levels aimed at 1315+/-. Both scenarios will be affected by the DXY ( U.S Index ) performance as U.S releases Unemployment claims today at 12:30 PM GMT. General Overview: The market is showing a near term secondary selloff, calling for a test of the 1279.20* support. Look for follow through selling today. A close under 128020* targets declines back through the 1270's. Any corrections capped by 1291.80* will favors further declines. A close over 1296.80* is needed to flip back to bull trending. Our preference: long positions above 1.3145 with targets at 1.3225 & 1.3260 in extension. Alternative scenario: below 1.3145 look for further downside with 1.3100 & 1.3060 as targets. Our preference: long positions above 113.45 with targets at 114.30 & 114.80 in extension. Alternative scenario: below 113.45 look for further downside with 113.05 & 112.70 as targets. Our preference: short positions below 1.1790 with targets at 1.1740 & 1.1720 in extension. Alternative scenario: above 1.1790 look for further upside with 1.1820 & 1.1840 as targets. Our preference: short @ 0.7820 with targets @ 0.7800 & 0.7780 in extension. Alternative scenario: above 0.7835 look for further upside with 0.7855 & 0.7870 as targets. Crude Oil‏ (WTI)‏ (Z7) Intraday: further advance. Our preference: long positions above 51.60 with targets at 52.40 & 52.60 in extension. Alternative scenario: below 51.60 look for further downside with 51.30 & 50.85 as targets. 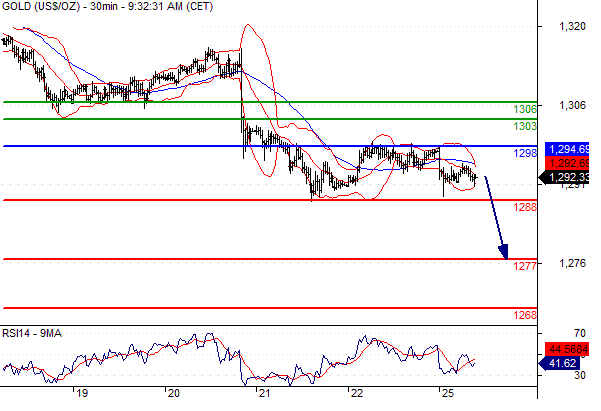 Our preference: short positions below 1282.00 with targets at 1270.00 & 1265.00 in extension. Alternative scenario: above 1282.00 look for further upside with 1286.00 & 1291.00 as targets. Our preference: short positions below 1.3230 with targets at 1.3155 & 1.3125 in extension. Alternative scenario: above 1.3230 look for further upside with 1.3260 & 1.3290 as targets. Our preference: short positions below 113.75 with targets at 113.10 & 112.70 in extension. Alternative scenario: above 113.75 look for further upside with 114.10 & 114.30 as targets. Our preference: short positions below 0.7825 with targets at 0.7765 & 0.7745 in extension. Alternative scenario: above 0.7825 look for further upside with 0.7855 & 0.7885 as targets. Crude Oil‏ (WTI)‏ (Z7) Intraday: the downside prevails. Our preference: short positions below 52.10 with targets at 51.65 & 51.30 in extension. Alternative scenario: above 52.10 look for further upside with 52.30 & 52.60 as targets. Gold spot Intraday: bullish bias above 1276.50. Our preference: long positions above 1276.50 with targets at 1284.00 & 1291.00 in extension. Alternative scenario: below 1276.50 look for further downside with 1272.00 & 1267.00 as targets. GBP/USD extends the downtrend momentum for eighth consecutive session after peeking to 1.3227 high yesterday, the pair failed to press forward and hold gains, taking a dip to 1.3113 low and closed at 1.3131. Currently the pair is trading narrow with 20-pips price action after hitting 1.3116 low support, but expectations for higher volatility as UK releases its quarter GDP shortly. Technically, on the chart we can notice that GBP/USD is capped inside wedge triangle and has been touching the boundaries but failing to close neither above the descending trend line, nor below ascending one, putting the pair in a state of congestion in case daily price managed to close above or below both lines. Fundamentally, GBP/USD is traded cautiously. First Brexit negotiations still weighs negatively on the pair favoring selloff mood and last week Carney was noticed less hawkish than precious press conferences held, but rate hike in November is still on the table and open to discussion which keeps the cable on solid ground preventing it from severe losses. Today, expectations are placed for GDP at 3% as recorded previously. Market stands on two potential scenarios. First, in case GDP scored 3% or above, this should be taken as a booster and second, if GDP missed 3% target, then adding all the negative elements above, market should expect a heavier abandon for GBP/USD and extending the bearish momentum. General overlook: The market is still caught is a secondary decline. Near term trade is working through corrective congestion, but retains the bear bias. A close under 1.3080 should open ip a fresh bear leg. Near term trade may yet try to congest around 1.3154 +/- . A close over 1.3226* and 1.3260* are the triggers for a re-turn into higher prices. EUR/USD has been actively bullish since yesterday rallying from 1.1753 low recording 1.1817 high. Today, the pair extended yesterday's action and pushed higher at 1.1836 with expectations for more pips as 5-EMA crossed with 10-EMA from below. Today market is expecting a hawkish statement as Super Mario Draghi crosses wires at 12:30 PM GMT. On the other hand, rates are highly expected to be left unchanged at 0% point basis, which turns all the attention to the ECB's Gov. Draghi has mentioned previously in Sep that tapering with QE program and details will laid out in Oct as the ECB holds a press conference. At the moment, ECB is currently running QE purchasing at 60B value. Now the question comes is how much or at which pace will Draghi slow down the amount and setting specific dates. Note expectations are between 25B and 40B reduction. Logically, any tapering with QE as reduction should be taken positive and EUR/USD should rally as the event itself is highly anticipated since a long time of period. But still, market may not digest the details and below are possible scenarios that should take action. First scenario which most likely, ECB will reduce monthly bond purchasing at 30B value and commit to buying bonds till Sep 2018 with a guidance. (Positive for EUR/USD). Second scenario which is likely. ECB will cut bond purchasing by 30B and commit the QE program till Jun 2018. ( Less positive ). Last and fourth scenario which is unlikely, ECB will cut monthly bond buys by 40B and commit to buying bonds to Sept 2018. ( Strongly positive for EUR/USD). General comment: Comment Overall the market is bearish and penetration under Monday's low suggests a selloff under the last 1.1780 swing low. Near term trade is showing corrections and may again work sideways higher today. A surge over 1.18945 voids the bear alignment. However, a close over 1.1907* is the key to start a reversing turn and sustained climb to higher levels. EUR/USD was knocked out yesterday as the market undigested ECB's reduced QE size by half and simultaneously extended the duration, thus maintaining the same level of stimulus as before. As a result, the pair was on a massive selloff wave dipping from 1.1836 high to 1.1640 low, 196 pips during only eight hours. Today, EUR/USD extended losses at 1.1624 the months fresh lows with expectations for further dips in the coming days seeing the buck strengthening with 94.74 high today. Fundamentally, the U.S Index is back with a sharper tone sending strong message for all currency rivals as the House of Representatives has passed a budget bill paving the way for Trump's so long waited tax cut plan. The only bump at moment fronting is who will inherit the U.S Fed, still nominees are mixed between Powell and Taylor. Recent Reports has mentioned that current Yellen is ruled out, but rumors looms that Trump is worried about such scenario which could disrupt the hardy stock market rally that has taken place since his election. The Dow industrials have surged more than 30 percent from the low just a couple days before the Nov. 8 election. Last but not least, Spanish tension with Catalans referendum still vows which add more pressure on the EURO. Finally, this week risk event will be conducted with U.S GDP release today at 12:30 PM GMT with all eyes focused with expectations for a growth during third quarter. The data today will play significantly on the promised late U.S rate hike and DXY levels. Comment: The market triggered a significant downside breakout from sideways congestion of the past month, opening up potential for a bear wave to 1.1480. Trade is poised for continuation selloffs. Any corrections should be rejected up along the lower edges of recent congestion. Only a close over 1.1763* marks a short term turnaround.